This is my entry for this month's No Croutons Required. If you would like to join in the challenge then just get your camera out. Just submit a festive photo, it doesn't have to involve food, just try to capture the mood of this festive season. 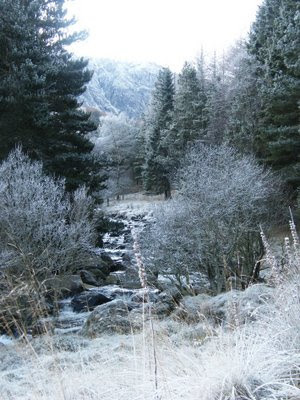 My photo is a shot of the Scottish countryside on a frosty winter's day. The ground is crisp and crunchy and the air so very fresh and nippy, lovely. Email your photo along with a title to me at nocroutonsrequired@googlemail.com by the 20th December 2009, with a link to your post that features the photo and your name and location. As usual, the roundup with run from the 21st December 2009 and the winner will be announced on the 31st. Jacqueline, that is such a gorgeous photo! Looks like a prize-winner to me. Oooh thats a gorgeous photo! Reminds me of the Old Country! A very crisp and beautiful winter day captured Jacqueline. I love your picture! You can smell the cold in the air! Wow, so serene and stunning! Hi Sarah, the Scottish countryside is very beautiful and very hilly! Is it giving you homesickness pangs Richard? Hi Rose, It is more pretty white frost we have just now, although there have been a few flutters of snow that haven't come to much, but everything is so white and gorgeous just now. My favourite kind Val, well apart from a hot summer's day of course, I could quite happily pass on all the rest, especially the rain. Taking time to get acclimatised now you are home again Johanna? No more cute little snow suits for a while. What a gorgeous photo! I am having major snow envy looking at this gorgeous photo! Please don't tell me how lovely and warm it is where you are Jenn, I don't think I could bear it! A festive and peaceful photo - I love it. oh no, i missed the entry date:( i had bookmarked it and thought it was dec 31st not 21st... and didn't read this post until now. oh le sigh. maybe next year then. lovely photo. and the mushroom soup and trifle in the other posts sound and look delish!